Writing books isn't my only creative outlet. I spend quite a bit of time drawing as well. Below are some illustrations I did related to my books that you might enjoy. Send me a message if there's a character or scene from one of my books you'd like to see. And if you want to see my latest art creations, follow me on Instagram. I realize this might not look like the Pinocchio you were imagining. First of all, he's not a wooden puppet. Well, neither is the Pinocchio from my Out of Abaton series. In The Wooden Prince, Pinocchio makes the transformation from mechanical servant to living boy. Here's a drawing I did of Pinocchio after he reaches the kingdom of Abaton. He's armed, armored, and ready to battle a host of grotesque enemies in Lord of Monsters, the second book in my series. With my drawings, I play around with different styles. This drawing of Lazuli was meant to be a bit more realistic-looking than some of the more cartoon-stylized drawings I've done. You'll see a totally different Lazuli below. The blue-haired sylph who commands the winds is the daughter of the ruler of Abaton. In The Wooden Prince, she's on a dangerous secret mission in the Venetian Empire to rescue her father when she meets Pinocchio. Needless to say, they go on to have all sorts of adventures together in the two Out of Abaton books. The ruthless and relentless soldier to the Venetian Empire, Captain Toro, is determined to capture Pinocchio and the traitor Geppetto. In the world of The Wooden Prince, magic has been introduced into Renaissance Europe. With it, Leonardo Da Vinci was able to build some of his famed designs, including a flying machine. Venetian airmen like Toro wear mechanical wings to patrol the skies. In my first novel, The Nine Pound Hammer, readers are introduced to Conker. The son of the legendary American folk hero John Henry, Conker is enormously strong. But as the story begins, he's not exactly the brave hero type. He performs as a "strong man" in Peg Leg Nel's Mystifying Medicine Show and Tabernacle of Tachycardial Talent. But after the safety of those he loves is threatened and Conker finds the hammer that once belonged to his father, Conker rises to the occasion. I hate to play favorites, but honestly of all the characters in my books, he's the one I think I love the most. On a quest to find his father in The Nine Pound Hammer, Ray Cobb winds up at Peg Leg Nel's traveling show, discovering not only answers about his father's disappearance, but also a connection he and the performers in the show have to the legendary figure of John Henry. Writers sometimes ask me about how I come up with the names for my characters. Since The Nine Pound Hammer is set in the 1890s, I researched popular names of that era. While Ray isn't so common today, it was big around the turn of the century. The name struck me not only for capturing the historical period, but also for the symbolism. Ray = light. He might seem like the most likely hero at first, but throughout the trilogy, he leads Conker and the others against the darkness of the Gog and his sinister machines. I wanted to show a bit about the characters's personalities here. Lazuli - brave and determined. Pinocchio - a little more hesitant. The fox general Mezmer is always ready with her spear. And the cat warrior Sop could use a little more exercise. For those who have read the book, notice the glowing Aleya in the background. In The Wooden Prince, Pinocchio is captured and sold to a theater company. But this is no ordinary theater. The people of Siena want to see gladiator style battles between automa (the mechanical servants like Pinocchio). Here we have Harlequin, the swashbuckling champion of the show. Normally it's no problem to have automa hack each other to pieces. They're wood and gears after all. They can be repaired. Pinocchio's problem: he's starting to transform into a living boy. So being pitted against Harlequin turns deadly fast. The idea for Harlequin and the theater came from traveling in Italy and learning about commedia dell'arte. 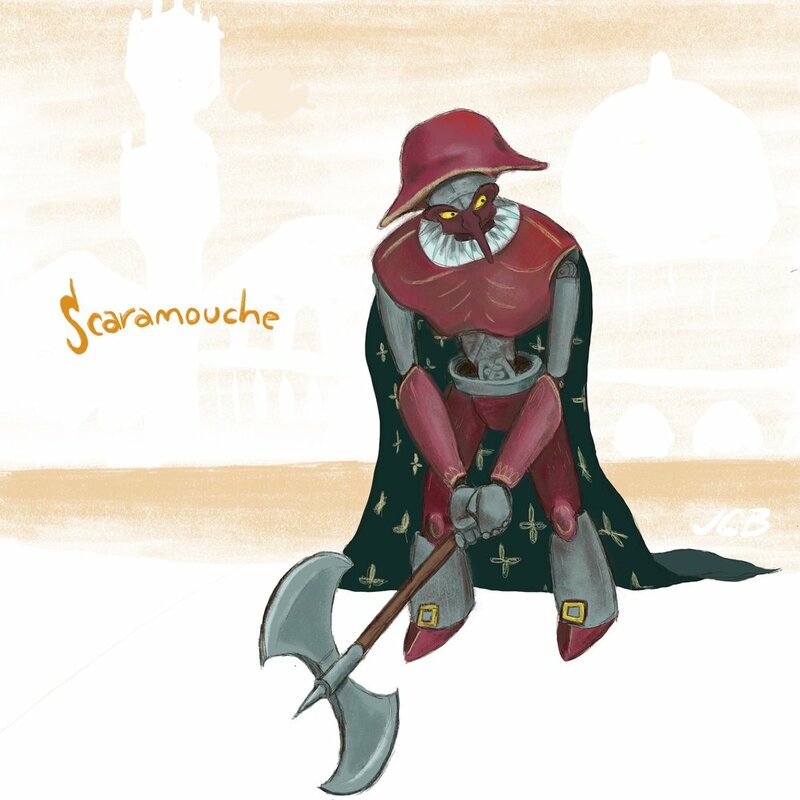 This funny and occasionally violent theater style used stock characters like Harlequin, Pulcinella (who became the Punch in "Punch and Judy" in England), and Scaramouche (whose illustration is below). You might not recognize this spelling, since a djinni is often called a "genie" in pop culture today. Traditionally from Arabic folklore, djinn (the plural form) are supernatural creatures and aren't captured in bottles to grant wishes except in the Aladdin story. In the world of my Out of Abaton books, djinn are one of four elemental humanoids from Abaton. They command fire. Pinocchio meets a couple of djinn in The Wooden Prince who aren't so friendly. But don't judge them all on Al Mi'raj and Cinnabar. Most djinn are quite good. And in the old days of Abaton, they were mighty warriors, like this fellow. In The Nine Pound Hammer, Jolie is a mermaid-like siren being hidden by Peg Leg Nel's medicine show. Having grown up with her siren sisters in the remote swamps of southern Louisiana, Jolie isn't used to being around ordinary people. She's a bit shy at first. And feisty, as Ray (the protagonist of the book) discovers the hard way when he discovers her. A former Rambler who has lost his powers after losing his leg, Nel now runs a traveling show in The Nine Pound Hammer. The book originally grew out of my intense passion for old-time America, its music, and the rich folklore of the American South. Peg Leg Nel is a root doctor, part of a tradition known as hoodoo. Not to be confused with voodoo, hoodoo is a form of folk magic that formed in the South and drew on West African, European, and Native American practices. If you've ever owned a rabbit's foot or had corn bread, black-eyed peas, and greens on New Year's Day, you've participated in hoodoo. 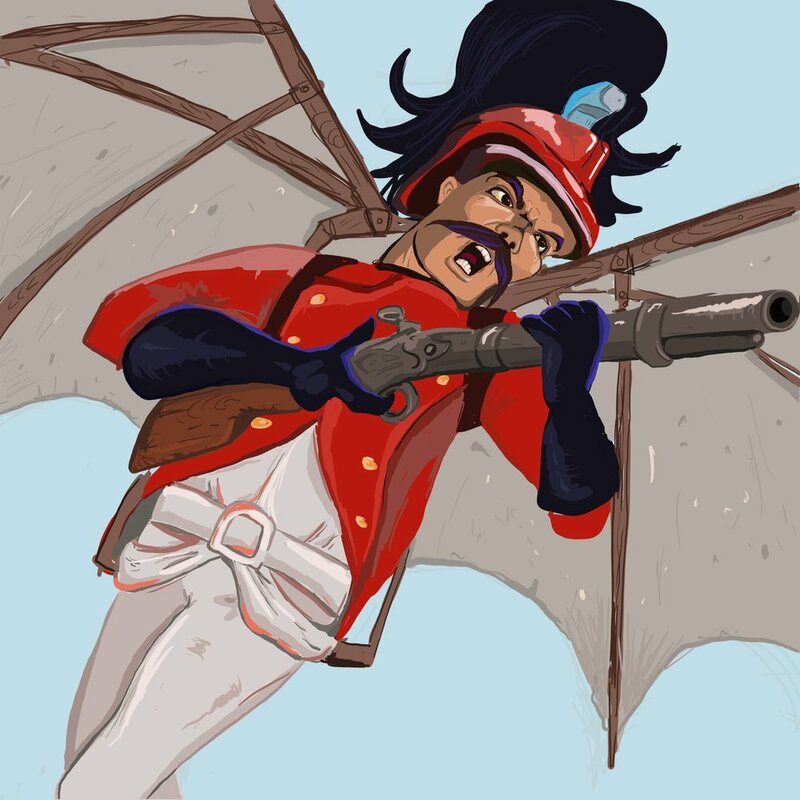 Eustace Buckthorn - otherwise known as Buck - is a blind sharpshooter who performs in Peg Leg Nel's traveling medicine show. Buck is a complicated character. He killed his brother as a boy (accidentally). Joined up with a band of outlaws and steamboat pirates. But eventually, he became involved in John Henry's ill-fated battle against the sinister figure known as the Gog. Rough around the edges and searching for redemption for the darker aspects of his past, Buck is a character I would like to one day go back and write more about in future books. The style for his art I should mention is inspired by R. Crumb and Buffalo Bill Wild West posters. In Lord of Monsters, Lazuli's aunt Lady Sapphira is the powerful and influential ruler of the sylphs. She commands her air elementals from the floating Mist Cities in southernmost reaches of Abaton. Her sister married Abaton's immoral ruler Prester John. And after her sister's death, Sapphira became a surrogate mother to Lazuli. Pinocchio and the heroes are devoured by an enormous sea monster in The Wooden Prince. And this is one huge sea monster! So big, in fact, that there are people and creatures living inside its belly, including Gragl. She might look disgusting, but Pinocchio quickly sees beyond her slimy, encrusted appearance. They become fast friends. As I mentioned above with Harlequin, the battle theater in The Wooden Prince, has some scary and oddball actors. Meet Scaramouche. Or as Queen sang, "Scaramouche! Scaramouche! Will you do the fandango?" Fandango? My Scaramouche says no. But if Pinocchio wants to go mano y mano with him and his axe, he gives a resounding "Thunderbolt and lightning! Very, very frightening me!" Sometimes, I just draw characters as I imagine what they are like. I'm not sure yet who she is, but I want her in a story. By the way, all the above illustrations were done on an iPad Pro using the Procreate app. I do most of my drawing with old-fashioned pencil and paper. But when I find a doodle I like, I snap a photo of it with my iPad and then add the color digitally with Procreate.